My writing updates...I'm trying something new. I'd tell you about it, but Louis Sachar said he doesn't even tell his WIFE when he's writing, let alone what he's working on until the draft is done. But I'm snowflaking it, and it has some ties to "Flight from Endwood." I didn't do any of that "take an hour" stuff (I just did it), but I'm about in the middle of Step 3. So at the Tucson Festival of Books on the University of Arizona campus, the next thing I did was actually try to get some money from the ATM (my bank's was out of order!) 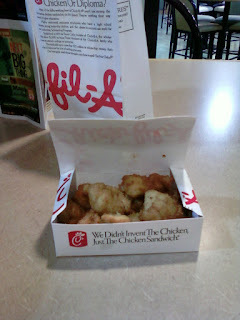 and then I hurried in to the Student Union and jumped into the shortest food line I saw (Chick-fil-A). Mmmm! A good thing she noted is that people don't make changes in life until they're uncomfortable--something must really go wrong, and you must force them to change. She noted you could wound a character using their childhood, events closer to the present, and even a physical wound (though that should also have emotional components). In short, something needs to wound your character, even if they don't know there was a wound there. You can use backstory to wound characters and make them sympathetic. Movies (the example she used was "While You Were Sleeping")--can start with backstory. You need a goal (what), motivation (why) and conflict (why not). That's pretty common and is mentioned in the Snowflake Method (though Randy Ingermanson flips motivation and goal--I think I might like Judy's order better). Who is the character at the beginning? What is the wound, and how did he or she get it? How does it drive him or her? Who is the character at the end? How has the wound healed? What will drive the character in the future? In short, know your characters and their backstories. Pamela had some additions (I recall her saying more than I have notes on; hmmmm.) One suggestion was that when you're stuck, you can perhaps treat the setting as a character (like in "Gone with the Wind"). You should have things that come between characters, as a wedge. I may be butchering Pamela's diagram concepts now; I forgot to email her to get the information from the handout, and the workshop was more popular than anticipated so they didn't have enough. But I have notes of her saying Term + Class = Distinguishing Characteristic. Characters tend to move through classes, but the term stays the same. So for Cinderella, her term is always "Cinderella." For romance, the hero's journey can mirror or correspond with the heroine's (like Prince Charming starts out as beloved as well). It sounds maybe ridiculously simple, but I just sketched an outline of the characters of my co-authored romance novel The Pirate and the Healer and they followed this formula pretty well. I tried for one of my other WIPs, Bonnie of Sheshack (working title), and it was interesting but a little harder. Near the end she asked, How do you make a book so compelling that the reader remembers the characters' names? Theme and detail about characterization will make them real. So how do you introduce that needed backstory? Judy said there shouldn't be a "dump," like the book starting with someone sitting in an airplane, thinking. Rather, it's best to give a little bit at a time, like an onion. She noted one way to figure it out was to go through a published book and mark the backstory to see how it was revealed. Judy did note that in one story, she had to put a lot of backstory right at the beginning to make sure the character (who appears to be a deadbeat dad) was likable. So in that case, the reader needed to know the character's motivations. Anyway, it was a lot more informative than I made it sound; I just took really bad notes. More next week! Interesting, Julie. Thanks for sharing.